They may say that all roads lead to Rome, but it was in Geneva, Switzerland, that Daniel, Lucy and David’s paths crossed. Dan and Lucy had just returned to Europe after two years of music study and English teaching in Japan. There, Dan had got to grips with the shamisen and shakuhachi, Lucy the koto and taiko, and both had entertained the locals in various accapella, rock and folk set-ups. This chapter saw the fruition of Dan’s remarkable song writing talents in the guise of “Kazuma’s Guitar”, a double album recorded in his bedroom. David, on the other hand had just unpacked after his return from India, his ears still ringing with its intoxicating rhythms and melodies, his legs still stiff after twelve months of cross-legged tabla apprenticeship with his guru. And so it happened that after a chance meeting, our three voyagers met for a tentative jam one evening in May 2003 and Tiger the Lion was born. With a nod to the Canadian band The Tragically Hip, whose song of the same name talks of the contradictions and difficulties in communication and the relationship between life and art, the band name also refers to symbols recognised the world over. The tiger is particularly prominent in Asia culture, which occupies a special place in the group’s collective heart. Not long afterwards came the band’s first album, “Healing Songs” (released December 2003), featuring 7 original songs chosen from their extensive repertoire. Tiger the Lion ensured its presence on the international stage from the outset, by way of a two week tour of the UK when even the venerable BBC’s interest was piqued enough to interview them live on air and give the track “Something About Nothing” airtime. With a new 5 track EP due to be released in early April 2006, a second UK Tour set for the same month, airplay on a number of UK and US and Swiss radio stations, their recent choice as one of Switzerland’s four best up-and-coming bands and a chance to play at France’s most prestigious open-air festival, “Les Eurokéennes”, Tiger the Lion are on the move! Their new recording features Indian harmonium in addition to the original instrumentation, with Dan on acoustic guitar and vocals, Lucy on koto, harmonium and vocals and David on tabla and other percussion. 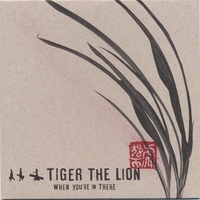 With their irrepressible spirit of adventure, Tiger the Lion are set to change the face of popular music. Original and brilliant, voice, guitar, koto and tabla. A new sound, intelligent, philosophical words to an original sound. Great harmonising with a male and female voice. With the right backing this band will go far. Exciting! All songs thought provoking!